Send your love, care, affection this Valentine wrapped up in yummiest and delicious cakes all the way to Jalandhar with MyFlowerTree. It’s the right time to amaze your sweetheart with surprise cakes online. 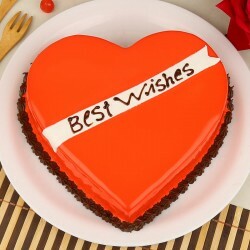 Choose our best, delightful cakes to make your darling happier on Valentine Day. Jalandhar is a beautiful city in the state of Punjab and we all are aware of it. If your lover is staying in Jalandhar and you want him/her to give a beautiful gift or a sweet surprise, then you can go for most alluring, tempting, fresh cakes from MyFlowerTree. Our delicious cakes are baked only by professionals. We ensure the fresh quality of cakes, that is baked on the same day of order. At our platform, cakes are a treasure of amazing taste that will leave your partner spell bound. So why to delay? You can anytime send Valentine Cakes to Jalandhar to make your other half feel amazed on this Valentine Day. When you are at MyFlowerTree, you need not to worry regarding the quality of cake and delivery services. We ensure you the finest quality in the entire industry at an affordable price range. No matter where you reside, you are in Jalandhar or any other part of India, You can depend upon us for the desired Valentine Cake Delivery Jalandhar. Our wide range of cakes, that are showcased at our portal, is a must to look at. You can go for some of our cakes designed specially for Valentine’s day like our Princess Theme Cake which you can send to your girlfriend, Red Velvet Heart Cake, Radiant rainbow cake, Lovey Dovey Cake, heart shaped cake, designer cake, Red passion cake and many more. We also have theme cakes, that are beautiful in every way. Personalised cakes are amazing, they are considered to be the ultimate gifts that spread magic of love all around. And specially when it’s valentines day, you can heighten up the romance by choosing personalised photo cakes at MyFlowerTree. Our personalised cakes are available in many flavors, you can choose from our pallate butterscotch, vanilla, red velvet, chocolate, strawberry, blueberry and others. The best part is that, you can get a cute photograph of your sweetheart embedded on the cake, which is just beyond the words. You dedication and commitment in relationship is only what makes couple grow together. And without gifting something really delicious, amazing and captivating, you cannot make your other half happier and feel special. So Send Valentine Cakes to Jalandhar without any hurdle through MyFlowerTree. Along with cakes, you can also go for our combo package, that includes, cake with flowers and cake with gifts. Now its time to celebrate the Valentines Day in an unique way, by ditching same old tradition. Go for surprising your other half, by choosing our same day delivery option or midnight delivery option.